Lawyer Loves Lunch: Yup, I'm Going to be on Gordon Ramsay's MasterChef! 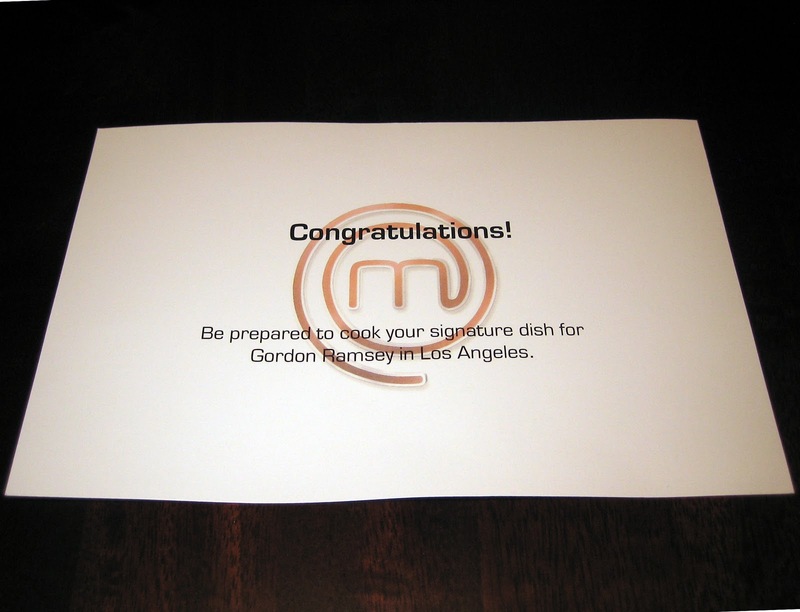 Yup, I'm Going to be on Gordon Ramsay's MasterChef! Enough with the play-by-play. After auditioning in person, auditioning on video, making a home tape, answering many essay style questions about myself and my cooking, undergoing a psych evaluation, oh, and promising them a kidney, the casting folks determined I was cool (crazy?) enough to be on MasterChef. The show premieres tomorrow, Tuesday, July 27th at 9/8c on FOX! Watch me make my teevee debut (aside from my one second of fame in the promo above)! With Chef Ramsay at the helm, you know it's going to be good times! After a nationwide search for the best home cooks in America, the series will turn one of 50 hopefuls into a culinary star and America’s first-ever MASTERCHEF. In the premiere episode, the hopefuls will have one hour to prepare their signature dishes and present them to the distinguished MASTERCHEF judging panel: Michelin-starred chef Gordon Ramsay; restaurateur and wine maker Joe Bastianich; and the youngest four-star chef in America, Graham Elliot. The judges are looking for passion, creativity and most importantly great flavor and taste. Only the most deserving home cooks who impress the judges will win the coveted white apron and will move on to the next round of the competition. Excerpted from the FOX press release. UPDATE: If you're in the US, you can watch the first episode here. If you're in Canada, you can watch it here. I made a brief appearance, but it looks like my turn before the judges should be in next week's episode. I think this is so cool! I've been looking forward to watching this show, should be lots of fun. You're so lucky you get to cook for Ramsey! I'd definitely be very nervous. This sounds like so much fun! Good luck and I will definitely be watching & cheering you on!! Amazing !!! So excited for you, do you know already what you will make ? I am so excited for you Azmina!! I am heading over to my DVR in one minute to recover this show. I can't wait to watch you on TV!!! Oh my goodness!!! SOOOO exciting!! I will most definitely be watching and cheering you on! Congrats!! That is so awesome!! Can't wait to see you on TV tomorrow! THIS is amazing!!! Congratulations! :) I'm goin to tivo it right now so I don't miss it... our house will be rooting for you!! Congratulations to you! Just discovered you post on foodblogs.com. Nice work! AMAZING! Congratulations! I love cooking shows (despite the fact I can barely boil water, I love to eat ...) so I will certainly be watching your debut. Have fun and I am rooting for you! YOU ARE UNBELIEVABLE and INCREDIBLE. Can I have your autograph? How am I your friend on twitter? It bears repeating: you are INCREDIBLE. No seriously, I just told all my colleagues at work. I make them care about my blog life. And the one who's obsessed with Gordon Ramsay and illegally downloads every single episode of Hell's Kitchen from the illegally-acquired wireless internet sourced from the restaurant across the street officially thinks I'm cool. This is AMAZING. I haven't watched television in ages, but I'm going to get her to illegally download MasterChef. Just for you, Azmina. BECAUSE YOU'RE AWWWWWWWESOME!! im so excited for u its not funny...im now thinking how id get 2 watch it in london though..i guess id have 2 search online an get a source...yaaay..good luck girl! Congratulations! I think you've just shown the blogging world that dreams can be fulfilled with hard work, perseverance, talent and pure strong-willed determination. How can I be so fiercely proud of and happy for someone I've never met! I got goose bumps reading your title. Holy cow!!! That is incredible! Congrats! Congratulations! This is such an amazing opportunity and you totally deserve it. I wish that I had a television just so I could watch you. I may have to go over to my parent's house just to watch you in your television show. I'm so proud of you! Good Luck! I have never watched Master Chef, but I think I might have to just tune in now! woo woo congrats! go lawyers! did you get to meet salty seattle? Congratulations! I'll be rooting for you! Excellent! Congratulations, I'll be watching! WOOT WOOT!!!!!! Congratulations Azmina! You totally rock for making it so far girl! Now go knock the socks off of those judges. Woohoo!!!!!!!!!!!!!!!!!!!!!!!!!!!! I am going to SO ROOT FOR YOU! So cool, congrats! What a great opportunity! Congrats! Congrats!! This is so cool!! All the best!!! AWESOME! I'm going to watch it and I will be so proud of telling my friends "I know her" hahaha even though we sort of know each other on a cyber world! CONGRATS!!!!! I'm going to DVR this...exciting!! Many congratulations! You go show Ramsay and the rest what you're made of. I hope you win! Congratulations! Can't wait to watch you compete! That is the coolest thing I have heard in a month of Sundays! What an opportunity!! Wow, congratulations. You know I will be watching the show, and will be rooting for you. Woo Hoooo! Congrats! That is very exciting. Best of luck to you! Yoohoo...this is amazing.I am definitely seeing you on TeeVee...Congratulations!!! WOW!!! I am so happy for you! Did you do your little dance? I'm so glad that I discovered your blog in time to enjoy your culinary success. Jim and I will be watching. Truly inspirational! This is amazing news! I am so so happy for you and this is a must-see tomorrow!!! Wow!!! Congrats! I will be watching. SO EXCITED FOR YOU! 2nd baking barrister- go lawyers!!! Can't wait to see it! Wow, this is my first time here on your blog and I am thrilled for you. Congrats! I love Masterchef! My fave has to be the original British series but I've also watched the NZ and Oz ones! Congrats!! You're going to do great, hopefully I can watch it somehow in Korea when I move, will have to search for it on the net! Well done! They're asking for NZ applicants for Master Chef atm but I haven't had the guts to apply lol. Dude I am SOOOO excited for you! I can't watch it tonight since I don't own a tv but you can bet I'll be watching it when it goes online tomorrow! AHHHH. SO EXCITED. Azmina, I watched it tonight! Looking at the snippets for the next episode looks like you made it to the next round. My eyes were glued to the TV and each time I saw you, this blogger cheered! CONGRATULATIONS!!!! You probably can't tell, but I'm yelling :D Wish I could watch it *sigh* but know that I'm still rooting for you anyways!!!! Holy sh*t! Congratulations! I have to catch in on hulu because I forgot to DVR the episode. I can't wait to follow your blooming "teevee" career! I'm on the edge of my seat! I'm hoping Ramsey's quote in the preview "This is what I've been waiting for" is for you! Sure seems to be! Wow! Oh my goodness, Congratulations! I'm so sad I missed it. This is so cool, remember all the little people now that your famous! Congrats! I so wish I looked at your post earlier. I will definitely have to be tuning in in the future. Best of luck!! Congratulations! My husband and I watched the 1st episode last night and know I'll be watching out and rooting for you! Way to go! Congratulations and good luck! I missed the first episode but will find it online - must add to my DVR! Just watched the episode! I guess you will be featured on the next one but it looks like it's gonna be an interesting show... I totally saw you in one of the shots...when gordon came into the room at the beginning and vented about how everyone had sucked. LOL. That must have been crazy. Oh I 'm so excited for you and can't wait to see what happens! I saw next weeks preview and I totally realize you're not allowed to tell us anything... But did I see/hear correctly - in next weeks preview - that Gordon Ramsey said you are what he's been waiting for???!!??!!??!! SOOOOOO exciting!!!!!!!! Is it next week yet??? Ooo, did a scene zip by that had you with a MC apron? Can't wait to see how you go next week! Did you know you're on IMDB now? Wow Congrats to you! I only wish the show aired here, I'll have to see if I can find it online.